The Skirball Center is fantastic for wedding photography if you like a modern background for your nuptial celebration. 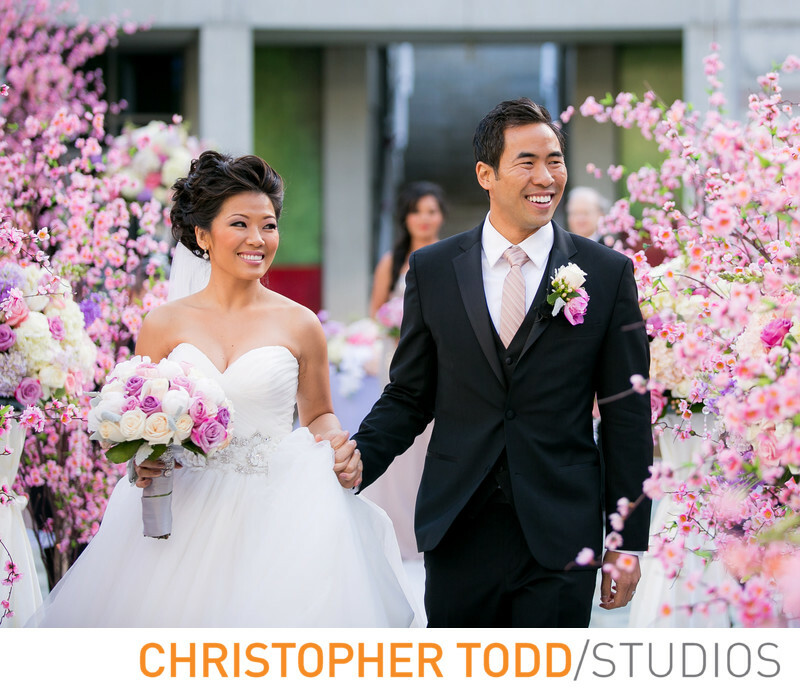 The Skirball has a wealth of colors and modern architectural backdrops for wedding photos. In this photo the bride and groom walked down the aisle after sealing the deal with a kiss during their wedding ceremony. I love the natural happiness on their faces and the relaxed smile of the groom. This wedding ceremony was planned by celebrity planner Slomique Hawrylo owner of Carpe Diem Events in Los Angeles. The ceremony inspiration was cherry blossoms closely related to the bride and grooms Asian family roots. The vibrant pink color contrasts the cool tones of the SkirballCenter's ceremony space. This was the first wedding I photographed with a drone. The videographer from Orange County ScenEmotion films had a drone flying around the venue that was totally distracting all the guests, as no one had ever seen a drone. This weddings reception space in the Ahmanson Ballroom was one of my most beautiful to ever photograph. The screwball cultural center is located in Los Angeles between the Valley and Westside. Couples celebrating their can easily travel to the Getty Museum located one exit south on the 405 freeway for a completely different look with skyline views of downtown Los Angeles. Location: Santa Monica Mountains National Recreation Area, 2701 N Sepulveda Blvd, Los Angeles, CA 90049.